A massive character-centric expansion for Vagabonds of Dyfed RPG. Tables, tools, and new rules for PCs and GMs alike! 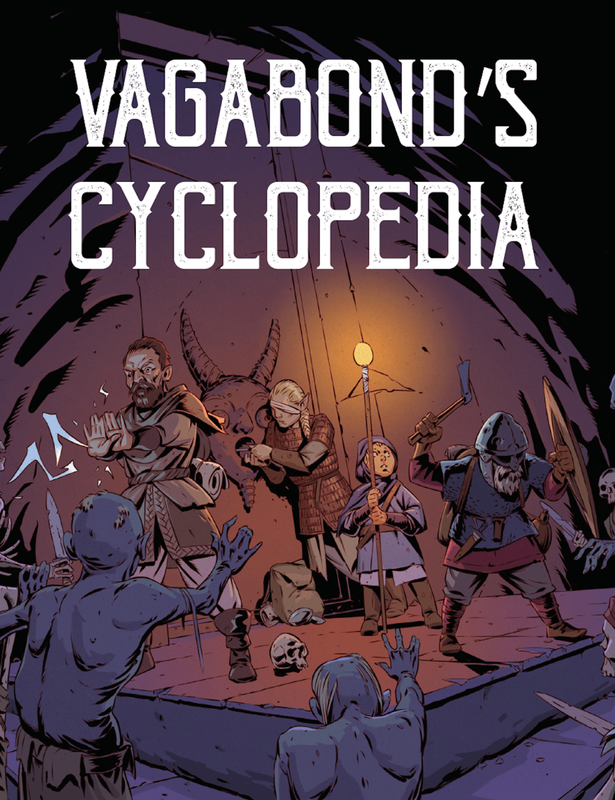 The Vagabond’s Cyclopedia is an enormous character supplement overflowing with hundreds of new character rules, tables, guidelines, and suggestions on how to play as a vagabond. While it’s designed specifically for Vagabonds of Dyfed, it’s still useful for other fantasy adventure PbtA or OSR roleplaying games. The Cyclopedia is a player-facing, character-centric expansion. The majority of the book is built to make it easier and more interesting to run characters, expand your library of available options, and give you new tools to use for your vagabonds. An essay on vagabonds: guidance on how to play as a “vagabond”: a grave robber, a wandering miscreant, a bannerless mercenary compelled to plumb dark pits for plunder and face demonic forces for the thrill of it. Tables and tools: random tables and generators for each of the six character traits, dozens of descriptors, inspiration for roleplaying, random core flaws, and even a semi-abstract way to come up with fresh character concepts you wouldn’t have on your own. Advancing beyond level 6: new rules for high-level play including how to handle powerful characters and deal epic damage. Wipe out entire swaths of enemies and strike fear into hordes with a single roll! New archetypes: there are eight new archetypes -- fully pre-made characters that include all of their traits, techniques, and equipment. Pick up and play as the Inquisitor, the Visceralist, the Monk, or others in a matter of seconds. New lineages: seven new lineages to hail from, giving new options, special abilities, and characteristics for your vagabond. Play as the rodent-like nezumi, the planar-touched ichoroid, the powerful minotaur, and more. An abundance of techniques: techniques are an enormous part of Vagabonds gameplay, defining your character beyond simple modifiers. The Cyclopedia adds over 100 techniques in all manner of categories and levels of complexity. These flavorful entries are a combination of entirely new subsystems (such as crafting poisons), tried-and-true “moves” (such as recruiting new retainers), and straight-forward mechanical and narrative cues (bonus to damage; never fail at certain actions; consider this as that, and so forth). Reputation: the PCs will develop a reputation, and the Cyclopedia breaks down how different NPCs react. Further, the party’s infamy and glory can be tracked, making their impact on the world more obvious. Burning down the Royal Guard’s capital ship? The Crown has a bounty on your head, but the Freebooters of the Skull Isles love you for it. Connections: a quick method to determine if a PC has any known NPC allies, relationships, or networks in the area. This can be used to somewhat randomly (but consistently) generate a complex web of relationships. The PCs are vagabonds after all; they’re likely to have tumbled through most salty towns at some point or another. Expanded allies: the rules for “allies” have been significantly extended. Each ally can have a framework of special benefits, tags, and even ways to advance and improve over time. Sometimes the tried-and-true core rules just don’t cover off on everything. What happens when the party’s amount of silver becomes difficult to track? What’s the outcome of a raucous celebration? How can the party’s dark sorcerer delve more deeply into the arcane? Wealth: the Cyclopedia contains a simplified and abstracted way to represent a character’s wealth, how to leverage these riches, and how it can easily change based on their actions and assets. Want to bribe your way to a seat at the Council Table? Roll +wealth. Rituals: spells and magic in Vagabonds of Dyfed are pretty flexible and abstract, with only a few techniques to go off of. We’ve included rituals to greatly expound upon the nature of casting large scale spells, including a highly detailed “requirements” subsystem which includes things like materials, time, sacrifice, and so forth. Wither entire farmlands, strike down armies, or curse the Emperor (all it’ll cost is some dragon fangs and the blood of an innocent). Critical damage and injuries: it’s easy for vagabonds to start to feel pretty invincible after their first few adventures; likewise some GMs struggle to appropriately penalize their PCs for getting knocked to 0 HP too many times. The Cyclopedia’s critical injury rules make combat significantly more deadly and wounds more permanent -- lose limbs, go blind, crack ribs, and more. Carousing: what’s all the silver in the world worth if you can’t throw an insane party? The Cyclopedia contains rules on carousing, a new form of downtime activity. Carousing uses the basic “move” core mechanic, but leverages how much silver you’re willing to toss into having a memorable night. Each time you carouse, you roll on a series of tables to determine what maladies, mishaps, or happy coincidences you wake up to the next morning. This title was added to our catalog on April 07, 2019.